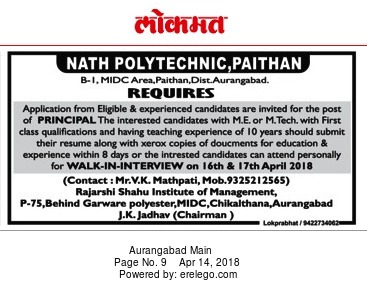 Nath Polytechnic College, Paithan has advertised in THE LOKMAT newspaper for recruitment of Principal jobs vacancies. Interested and eligible job aspirants are requested to apply with in 8 days from 14th April 2018. Check out further more details below. 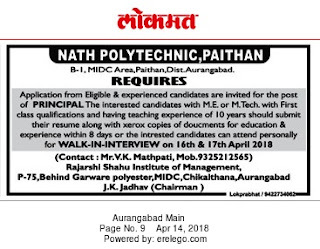 Name of the College : Nath Polytechnic College, Paithan. About College: This college was started by a group of industrialist with the sole aim of imparting best education to the students in the region. The Nath Polytechnic was started from the academic year 2007 for imparting professional training in engineering discipline to the new generation. It is an attempt by SSSVS trust to prepare the new generation to meet the challenges of changing economic scenario. The anticipated growth in market due to globalization and privatization is expected to create a greater demand for engineering personnel at various levels.The engineering program at Nath Polytechnic is approved by the AICTE, New Delhi and approved by MSBTE Mumbai. The emphasis of the institute is on providing specialization in Technology. The institute provides additional training to the students as suggested by the experts from academic and professional fields. The engineering program at Nath Polytechnic is approved by the AICTE, New Delhi and approved by MSBTE Mumbai. The emphasis of the institute is on providing specialization in Technology. The institute provides additional training to the students as suggested by the experts from academic and professional fields. The Institute has all the required infrastructure as prescribed and verified by the All India Council of Technical Education, New Delhi. Application from Eligible & experienced candidates are invited. Interested candidates with M.E or M.Tech with first class qualifications and having teaching experience of 10 years. How to Apply: Interested candidates are requested to submit their resume along with Xerox copies of documents for education & experience within 8 days or the interested candidates can attend personally for walk in interview on 16th &17th April 2018.